You will be given a reference e-book to read which has 820 pages And the test will be based on that e-book , you can take final test within 1 year of purchase. Digital signal processing refers to the process of mathematically manipulating information signal as a means of modifying or improving it in a few ways. In most cases, it is mainly characterized by representing discrete frequency, discrete time and any other discrete domain signals through proper sequencing of symbols and numbers and accurately processing all these signals. It should be noted that digital signal processing also involve speech and audio signal processing, spectral estimation, digital image processing, statistical signal processing, systems control, seismic data processing, biomedical signal processing, communications signal processing and radar and sonar signal processing. One of the major objectives of this popular process is to effectively filter, compress and measure real-world analog signals that run continuously. One of the many steps associated to this process is convert signals starting from the analog form into digital with the help of ADC or analog to digital converter by first sampling and finally digitizing the signals. This works in transforming the signal in analog form into numbers. It should be noted that while the process of digital signal processing is quite complex, it is still more beneficial than analog processing because applying computational power works in instantly detecting and correcting errors during the transmission process and effectively compress data. Digital signal processing is also extremely beneficial because it is capable of effectively executing mathematical functions including addition, subtraction, multiplication and division in the fastest manner possible. The digital signal processing certification program which is now accessible at Brainmeasures has received extreme popularity at present because it is known to be developed in such a way that it helps aspiring expert digital signal processors learn everything about the whole process in a simplified way. The simplified version of this digital signal processing course is definitely a huge help in your attempt to easily understand even the most complex aspects related to digital processing so reaching your aim of becoming a certified digital processor will never become impossible. It allows you to enjoy a comprehensive and well-developed digital signal processing training which is a huge help in maximizing your knowledge about the process, its major functions, objectives and benefits, how the digital signal processing process really works and the different tools and techniques that you can use to make the whole process work in your favour. Holding a digital signal processing certificate can help you access more stable jobs in this specific industry. How to accurately compute impulse responses? How to effectively filter random signals? How DFT and Z transform are related to each other? 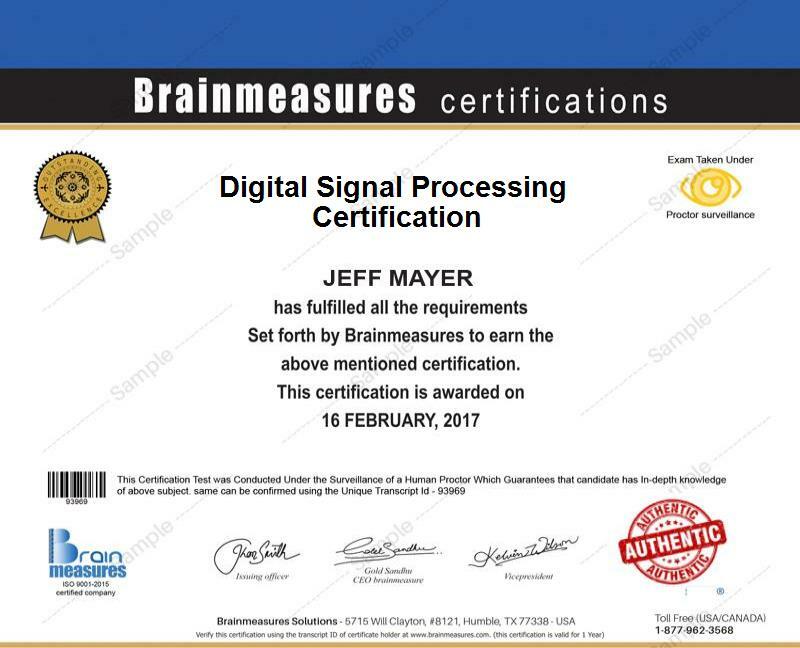 The digital signal processing certification program which is now accessible at Brainmeasures can be expected to work for hundreds of individuals and professionals. This mainly targets engineers, staff officers, managers and directors who are responsible in software, electronics, control systems, sonar, radar and communications, signal enhancement and detection, signal detection and hiding, audio, imaging and video including analytics and any other individuals and professionals who are greatly involved in evaluating, designing and developing systems that employ digital signal processing. A higher level of salary can also be expected as soon as you become a digital signal processing certification holder. Holding a digital signal processing certification allows you to work as a digital signal processing analyst which can reward you with around $37,000 to $75,000 annually. Using your certification to work as a digital signal processing engineer is also rewarding because it lets you enjoy an annual salary of around $82,000 to $113,000.